This is a guest post by Saideh Jamshidi, a journalist born and raised in Iran who is doing graduate study in journalism at the University of Wisconsin-Madison. She wrote this post to accompany the Islamic Feminism radio show. 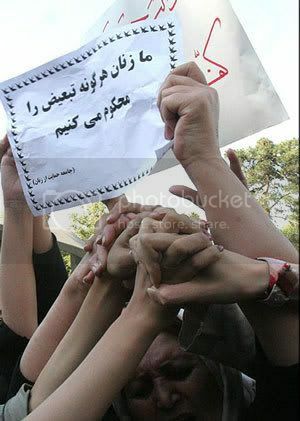 A group of Iranian women, many of them young activists, gathered in Haft Tir square in Tehran, Iran, on June 12, 2006, to collect “One Million Signatures” for women’s rights in Iran. They were asking the government to change “unjust” laws and to stop legalized discrimination against half Iran’s population. But the peaceful demonstration was brutally disrupted. Police attacked the unarmed women and beat them with electronic batons. Forty-eight women and 28 men were arrested that day. They were detained and prosecuted on charges of “endangering Iran’s national security” and “participation in an illegal assembly.” A chain of arrests followed days later, and many more women’s activists were detained and prosecuted on vague charges. Although the “One Million Signature Campaign” is alive and running, gathering signatures involves huge risks. The government brings women to court if they try to update their website “Change for Equality,” if they gather in their homes to talk about the grassroots movement, or if they stand on the streets to ask for signatures. Parvin Ardalan, one of the leaders of the campaign, was removed from a flight at Tehran’s International Airport on March 3, 2008. Ardalan was heading to Stockholm, Sweden, to be awarded the 2007 Olaf Palme Prize for her work on gender equality. The latest arrest is that of Nasrin Sotoudeh and Mansoureh Shojaee. They were tried in the Revolutionary Court in June 2008, and charged with taking action against Iran’s “national security” and having “unauthorized relations” with Iranians outside the country. Although the government pressure is very high, the One Million Signature Campaign has never cooled down. According to an official report, more than 30,000 signatures from Iranian women living inside Iran or abroad have been collected so far, and the number is rising. This entry was posted in Gender, Middle East and tagged Iran, Women's Rights by Guest Contributor. Bookmark the permalink.